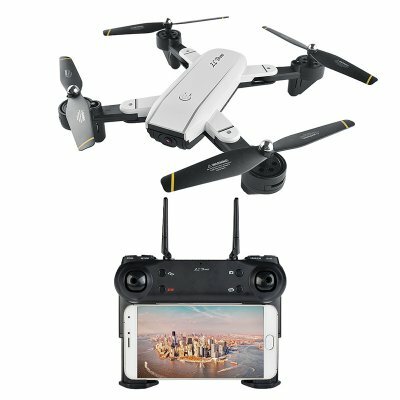 Successfully Added HK Warehouse SG700 RC Drone - HD Camera, 6-Axis Gyro, Lightweight Design, 90m Control Distance, LED Lights, Headless Flight Mode to your Shopping Cart. Cruise through the skies in style with the SG700 folding drone. This compact RC drone features a lightweight design. It has been crafted out of tough ABS material and comes with four high-quality blades. The drone is easy to control via the included wireless remote which makes it a great gizmo for beginning drone pilots and professionals alike. With its 6 axis gyro, the quad-copter offers a stable in-flight experience no matter the weather condition. You’ll be able to easily carry your drone along anywhere you go and enjoy hours’ worth of fun and outdoor entertainment to come. Thanks to a built-in 2MP camera, this video drone allows you to shoot stunning pictures and HD video from the skies. With this RC drone at your disposal, you’ll be able to experience your surroundings from a totally different perspective. Use it to shoot video of an upcoming sport game, nature pictures, or simply to scout around - this video drone is sure to meet all your demands. Thanks to a powerful 900mAh battery, your drone is able to stay in the skies for up to 10 minutes in a row. This offers you enough time to fly around and to capture the perfect picture. The SG700 quad-copter furthermore supports FPV that allows you to enjoy real-time drone footage on your iOS or Android phone. This powerful folding drone is capable of reaching flights speeds of up to 8m/s. It furthermore features a 90m control distance which will treat you to a feeling of absolute freedom. Thanks to its headless flight mode support, you can easily cruise around through the skies even if you have never flown a drone before. It comes equipped with colorful LED lights which make it possible to use your drone at night time without losing it out of sight. If you’re looking for a compact and affordable video drone, the SG700 certainly is a cool electronic gadget to consider.